Bressler Vineyards makes a very limited number of larger format bottles. Most of these are used to help raise money for our favorite charities, but some are available for special requests. This year was particularly cool, although every now and then we had a few days over 100 degrees. 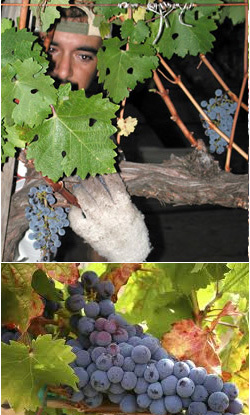 We had some heavy rains in September, but kept our fingers crossed and didn't pick until the grapes were ripe. As a result, we were rewarded with some excellent wines! The 2010/11 winter gave us lots of rain, some of it quite late, even into June. In fact, there was a big hail storm in May. Global weather changes really are keeping us on our toes. We were lucky in that we completed flowering between the hail and the last big rain storm. As a result, we have nice even clusters with small berries. Production will be on the smaller side, but the concentration should be excellent. Sadly, not eveyone in the valley was quite so lucky.